Employers who refuse to pay persons the correct wages under the Governmentâs new minimum wage increase rates can find themselves in hot water. âWe cannot have people working, giving an honest dayâs work in the capital of the country and being underpaid in plain sight,â said Minister of Labour Camillo Gonsalves last week Friday, April 28, during a press briefing held specifically to announce the minimum wage increase. Speaking at Cabinet Room, Gonsalves stressed that he has asked the Labour Commissioner to implement, as aggressively and as conscientiously as the resources allow, action, that fights against employers who refuse to adhere to the minimum wage rates, as the wage increases have already been gazetted and he is protesting strongly against persons who refuse to comply. âI want to say very clearly that there are civil and criminal penalties for not paying people the minimum wage. I want to go beyond that. I want to talk to the cashiers and the sales clerks and the checkout attendants working in retail establishments here in Kingstown… I want to tell you your rights, you are cashiers and the minimum you can be paid is $800 a month; sales clerks, the minimum you can be paid is $700 a month; checkout attendants, office attendants, packers, cleaners, the minimum you can be paid is EC$600,â stressed Gonsalves. He went on, âit is not a lot of money, but I know that there are people in stores in this town that are being paid less than the minimum wage before we raise the minimum wage and I know this because they have come to me, because I am the Minister of Labourâ. Under the new wage increase, cashiers [with previous working experience] must be paid EC$800 a month, up 14.3 per cent from EC$700. Checkout attendants, office attendants, packers and cleaners [full time], should be paid EC$600, up 20 per cent from EC$500. Sales clerks should now earn EC$700, up 16.7 per cent from EC$600. Most of the increases are over 20 per cent, while accounts clerks who currently work for $700 â $800 should now earn EC$1,015 monthly, an increase of 45 per cent/27 per cent. Gonsalves says that while he has received numerous reports of underpayment in the capital, what usually happens is that when the Labour Department tries to move forward to prosecute the offender, the person who makes the report backs down or is compensated when the employer gets wind that there is a complaint. âI have also asked the Labour Department to actively and aggressively follow up on some of the allegations and I believe that there are more than allegations. I believe that they are rooted in fact. There are people in this country and particular in this town, who are not paying the minimum wage in retail establishments,â said Gonsalves. He added that he was singling out retail establishments, because the employees of these establishments are the people who complain to him about violations. âI am talking about the areas in which I, as Labour Minister, have heard complaints,â stressed Gonsalves who added that according to legislation, âany employer who fails to pay a worker to whom a wages regulation order applies, remuneration not less than the statutory minimum requirement, or fails to pay any such worker holiday remuneration subject to the conditions specified in the order, or fails to show any such worker the holidays fixed by that order, is guilty of an offence and liable to a fine of $1,000â. He said that other fines can apply thereafter if the employer does not comply. âAdditionally, there are criminal penalties, if you donât pay people who are daily paid the money for which they are due,â said Gonsalves, who stated that he believes that the minimum wages are not onerous on the commercial sector. âI believe that, yes, people must work and be productive in the times that they are on the job, but people must get an honest dayâs pay for an honest dayâs work,â said Gonsalves. 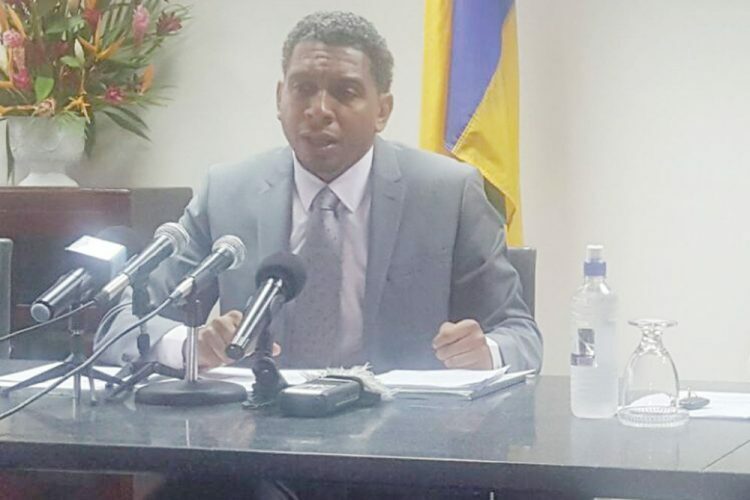 The Labour Minister said that on this issue, the Government should be leading from the front and he has asked Cabinet to make sure that the Government is complying with the Minimum Wage Act and as such, a review to make sure that the Government is a model employer is being conducted. The body that reviewed the minimum wage, the National Wages Council, was founded in February 2015 by the Government, in accordance with the Wages Council Act. The Council was given the mandate to review minimum wages with a view to increasing them. Gonsalves said that this latest increase is the first increase since 2008 and prior to that, 2003. He said that the increase from 2008 to 2017 will show that most of the increases are in the area of 20 per cent and more, and some of them are over 27 per cent. He noted that with the increases, the Wages Council considered, very carefully, testimonies from employers and employees and also consulted with economists and lawyers, among others, as it made no sense to increase the minimum wage so high that fewer people get money because an employer must fire people. ââ¦It is always a balance in raising the minimum wageâ¦raising it in a way so that it does not have an adverse effect on employment, create more wealthâ¦ but not raise it so high that they feel they have to let people go,â said Gonsalves. The Minister also noted that in St Vincent and the Grenadines, wages tend to not wait for Government to legislate, but tend to rise before the Government establishes new minimum wages. ââ¦So, if you look at some of these things, you would see, for example, that the old wage, as of Wednesday [last week] for an agricultural worker was $30, but I donât know if you could have gotten an agricultural worker to work for $30 in reality; if you offered them, they would say they not working for that, because workers have their own sense of the value of their labour and new standards and norms are set and that new standard or new norm sometimes just reflects the formal legislation,â commented Gonsalves. He said that the formal legislation sometimes takes us forward by raising the minimum wage, but sometimes just reflects what is happening on the ground. Gonsalves said that sometimes when wages are increased, workers start to renegotiate the value of their wages upwards, but he is not encouraging workers to be unrealistic, as in his opinion, a lot or workers are earning above the minimum wage. âThis legislation comes in line with existing realities, but in some cases, the wages have gone up beyond the actual minimum,â said Gonsalves, who added that for the first time, this country has had minimum wages set for the media. âThis reflects the Governmentâs commitment to workers and the Millennium Development Goals. I am very proud of the record we have on increasing the minimum wage,â stressed Gonsalves, who added that this Government has made far more increases than previous administrations.